Colorbond is tasteful, durable and adaptable. We have more than 20 colours that you can select from including bluescope steel zincalume. Colorbond roofing is light weight compared with terracotta or cement tiles. Less weight means less pressure on the building structure which greatly reduces any chance of structural damage to Sydney domestic, commercial and industrial properties. With a huge range of colours and finishes, the team from Tandem Trades can help you choose the right Colorbond or Zincalume roofing solution for your needs and you are guaranteed that our experienced roofing team will deliver a quality finish at the right price. We are very experienced in providing residential, commercial and industrial customers throughout Sydney with innovative, modern and cost-effective Colorbond and Zincalume roof installation solutions - and no project is too small or too large for our professional team. 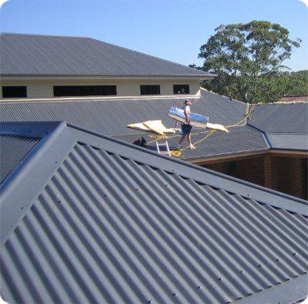 We offer residential, commercial and industrial Colorbond and Zincalume Roofing Installation services throughout the greater Sydney area including Sydney,Sutherland Shire,St George,Inner West and the Eastern Suburbs Sydney. For an obligation free quote and evaluation of your Colorbond or Zincalume roofing installation needs, please contact us today.